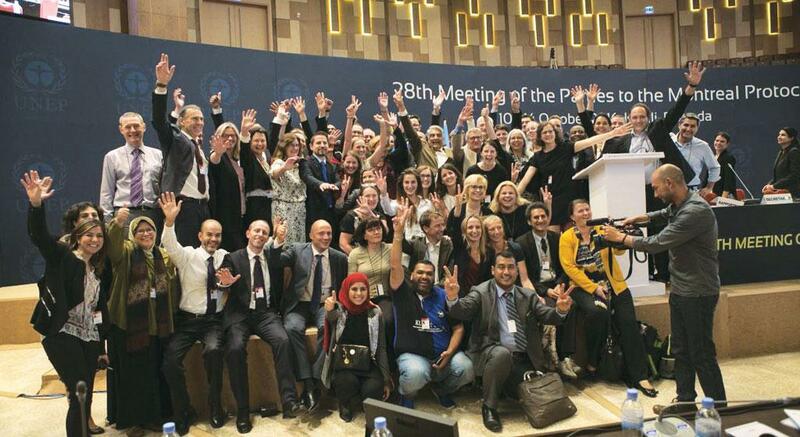 At the 28th meeting of the parties to the Montreal Protocol held on October 10-15 in Kigali, Rwanda, 197 countries adopted an agreement to phase down the use of hydrofluorocarbons (HFCS). These are super greenhouse gases used in refrigeration and air conditioning appliances and have a global warming potential (GWP) thousands of times more than carbon dioxide (CO2). The agreement will result in reducing HFC emissions equivalent to about 70 billion tonnes of CO2 by 2045. Unlike the Paris climate accord on climate change, this agreement is legally binding because countries will have to implement trade barriers for banned refrigerant gases. The agreement follows the principle of common but differentiated responsib ility. There are four groups of countries—two groups each of developed and developing countries—having their own HFC reduction targets. Developed countries will reduce HFC use first, followed by developing countries. India will reduce the use of HFCs by 85 per cent from its baseline years, 2024-26, by 2047 (see ‘Course of action’). HFC consumption in the baseline years is used to calculate the maximum amount of HFCs a country can consume. Countries have to start reducing consumption from this “peak” consumption. More importantly, India will start reducing its HFC consumption in 2028—one year before the developed countries have reduced their consumption by 70 per cent, which, as per the targets accepted by the developed countries, will happen by 2029. According to the Union Ministry of Environment, Forest and Climate Change, “The agreement recognises the development imperatives of high-growth economies like India, and provides a realistic and viable roadmap for the implementation of a phase-out schedule.” Director General of Delhi-based non-profit Centre for Science and Environment (CSE), Sunita Narain, also welcomed the agreement. “It reflects the emerging reality of a world in which China will have to take more and more responsibility to solve global environmental issues,” she said. China accounts for 60 per cent of global HFC production and 25 per cent of global consumption. It has agreed to a more stringent set of targets than India, which accounts for less than three per cent of the global production and consumption of HFCs. The agreement will also increase the funding from developed countries to the Multilateral Fund—the funding mechanism under the Montreal Protocol. But details of the financial commitments from developed countries are still to be decided. The draft guidelines for funding will be formulated in three years. During the negotiations held before the meeting, India proposed that it will advance its baseline from 2028-2030 to 2024-26 if the developed countries agreed to reduce their HFC use by 70 per cent by 2027 and provide greater assistance to the developing countries in terms of finance and technology. There were also discussions on a dual baseline among developing countries—one for China and those who wanted to align with it, and another for India and other developing countries. On the first day of the meeting, China (and others willing to join it) agreed to a baseline of 2020-22, while other developing countries, including India, agreed to a baseline of 2024-26. The demand for a dual baseline was opposed by the developed countries till the last few days of the meeting. On October 13, India voluntarily banned the release of HFC-23 (a super greenhouse gas with a GWP of over 14,000 times of CO2), which now has to be implemented by companies operating in the country. This action is likely to reduce the emission of HFC-23 equivalent to 100 million tonnes CO2 in the next 15 years. The announcement put additional pressure on the US and China—the two highest HFC-23 emitters—and both the countries agreed to eliminate HFC-23 emissions by 2020. “India went with a clear strategy and a proactive agenda to enhance the overall environmental ambition of the deal and to protect the nation’s economic interests. The agreement not only protects India’s economic interests, but also doubles the climate benefits compared to the previous Indian proposal,” says Chandra Bhushan, Deputy Director General of CSE. In the short term, the agreement will not have any immediate impact on manufacturers and consumers in India because the country’s obligations start only in 2028. The delay will give manufacturers time to make the transition to lower GWP alternatives. Moreover, technologies to use natural hydrocarbons, which are accepted HFC substitutes, are already available in the domestic refrigeration sector. Even in the longer run, HFC phase out is unlikely to have much impact because by then the technology would have substantially improved and economies of scale for HFC alternatives would have increased. The agreement, therefore, is a great opportunity for the Indian industry to chart a new environment-friendly growth trajec tory based on non-fluorinated chemicals like hydrocarbons.